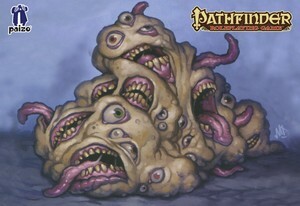 Nothing quite compares to the horrible 'gibbering' sounds this abomination of abominations makes. Seriously, this kind of thing is why we made Syrinscape. It's all very well fighting a set of stats and feats, and yes, a good Game Master will describe this thing, but when you actually hear it, the cruel truth of the comic vileness of the Mouth Horror really hits home. Turn it on and enjoy the squirming this SoundSet will induce in all but the hardiest of adventures.